Celebrate a birth, anniversary, achievement or someone's life in a unique fashion by dedicating a bench for that special person or occasion. Choose the location you want in a park, garden or cemetery. You can adopt an existing bench or have a new one made especially for the occasion. The bench is based on a design first used in Preston Park in 1883. A stainless steel plaque with an inscription can be fixed to the back of the seat (we advise no more than fifty characters). Plaques have a 50 character limit. Additional characters cost: 85p plus VAT per character. 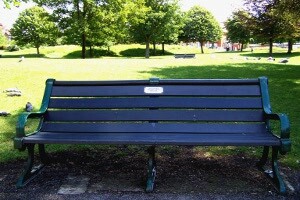 Please fill in an online application to adopt an existing bench or have a new one made. The process of dedicating a bench can take up to four months to complete. We do not hold a list of benches available to adopt but please let us know if you locate one without a plaque and we can look into its availability for you. Some locations may not be suitable for benches e.g. conservation areas, nature reserves, cemeteries and the seafront are subject to different arrangements. Please telephone us for details. For benches in Rottingdean or Falmer we will also consult with the parish councils. You can adopt an existing bench in Preston Park or The Level, but we cannot add any new benches to these parks for the moment. Unfortunately we cannot currently place benches in Hove Park, St Ann's Well Gardens, Pavilion Gardens and all along the Brighton & Hove seafront.